New Delhi, Oct, 2014: Come October, and we start shedding away our summer accessories, opening our arms to the winter season ahead. So, as you prepare for the winter sun and look forward to spending some time out in the open, make sure you have ample protection for the eyes. 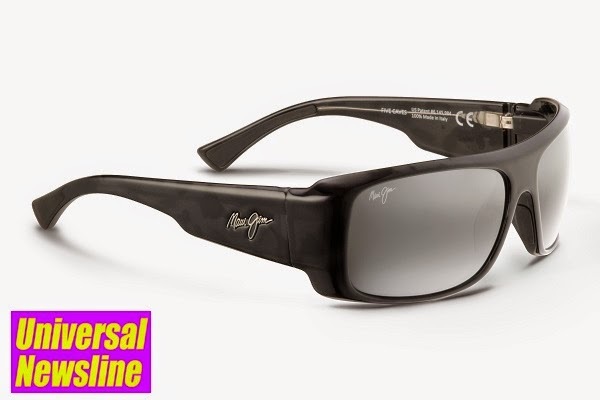 Leading polarized sunglass maker Maui Jim has come out with a super versatile offering this month, suitable for multiple purposes, from adventure outings to pool parties. If you are an adventure lover, quality, durability and comfort are the three features you are bound to look for in an accessory. The latest Maui Jim product to join the shelves – Five Caves – is ideal for the adventure lovers among you. Five Caves, a fascinating underwater adventure located in Maui, inspires the Five Caves sunglasses that come in four different color combinations, with a thick retro styled frame overlapping with attractive lenses. The shape is a modified rectangle with unisex appeal, and a design that complements Maui Jim's full frame nylon collection. Five Caves – the inspirational adventure spot behind this product – is located on the Hawaiian islands of Maui, and must be accessed with snorkel or scuba gear. You can swim through each beautiful rocky cave while exploring the many sea creatures and popular turtle hang out spot. Five Caves sunglasses have lens and frames that are saltwater safe, and a very versatile style that can be used for multiple purposes. Five Caves is available in Neutral Grey frame with Black and Grey Tortoise Lens; HCL™ Bronze frame with Dark Tortoise Stripe lens; Olive Stripe frame with Maui HT™ lens; Maui Rose™ frame with White Lenses. The frames are delivered in a high-gloss finish. “Five Caves is one of the most versatile sunglasses on our shelf. A variety of people take instant liking to it – from fashion conscious women to adventure maniac men. Five Caves suits multiple requirements with élan. Be it underwater sports, beach outings, pool parties or a corporate meeting, you can wear this pair to almost every kind of outing. Durable, scratch resistant, 20% thinner and lighter than standard laminated glass lenses for long-wearing comfort, Five Caves offers best comfort, protection and style whether you’re driving or relying on them every day,” says Mr I Rahumathullah, Managing Director, Maui Jim, India. In every pair of Maui Jim, you’ll find our patented PolarizedPlus2®, color-infused lens technology that wipes out 99.9% of glare, 100% of harmful UV and boosts color via specially designed lens treatments. So your view is clearer, with crisper contrast and amazing brilliance. For more Maui Jim has been voted favorite sunglasses company and best sunglasses by optical retailers and many of the top health, fitness and outdoor sports media around the world. All Maui Jim sunglasses have been awarded the Seal of Recommendation from The Skin Cancer Foundation as an effective UV filter for the eyes and surrounding skin. For more information, visit MauiJim.com or follow us on Facebook, Twitter or Pinterest at @OfficialMauiJim.